You didn't leave any way to contact you. Email me at dkgibson3@tx.rr.com. Happy Valentine's Day to you!!!!! Just letting you know that a new updated list went up today. Please check it out at www.katestrackshack.com. We've also got a Valentine Special going. 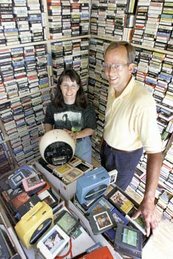 If you buy tapes from the list from now until the end of Feb. and have them tuned-up before they ship, the cost of tune-up's will be $1.50 instead of $2 per tape. Just mention the Valentine special when you place your order if you want them tuned-up. We love our customers - Happy Valentine's Day!!!!!!! Just letting you know that a new updated list has just been put up. Hope you are staying warm and having a good week!!! The flu hit here last week with two of our girls getting sick. We've had a couple of high 70's days the last few days but it looks like we may get some rain (much needed) and some colder weather coming our way. I guess that's to be expected in February! We haven't had any good memories for our memory page in a while. If you've got a good 8-track related story to tell, let us know and we'll put it up on the website.